How can your financial institution stand out in a crowded marketplace? Why don't we play a critical role in solving the nation's retirement problem? I recently read a report by the US Senate Committee on Health, Education, Labor and Pensions titled The Retirement Crisis and a Plan to Solve It, led by Senator Tom Harkin (D: Iowa). It called for the establishment of USA Retirement Funds to re-establish pension funds as part of the three-legged stool of social security, pension, and personal savings. Although it calls for USA Retirement Funds to be private, it used the typical keywords of "transparency, accountability, etc." that reads... government controlled or heavily regulated. The current methods proposed to fix social security such as increase retirement ages, change cost of living calculations, make wealthy people subsidize it, should give us pause that putting more resources and control in the hands of government flies in the face of our unique American independent streak. 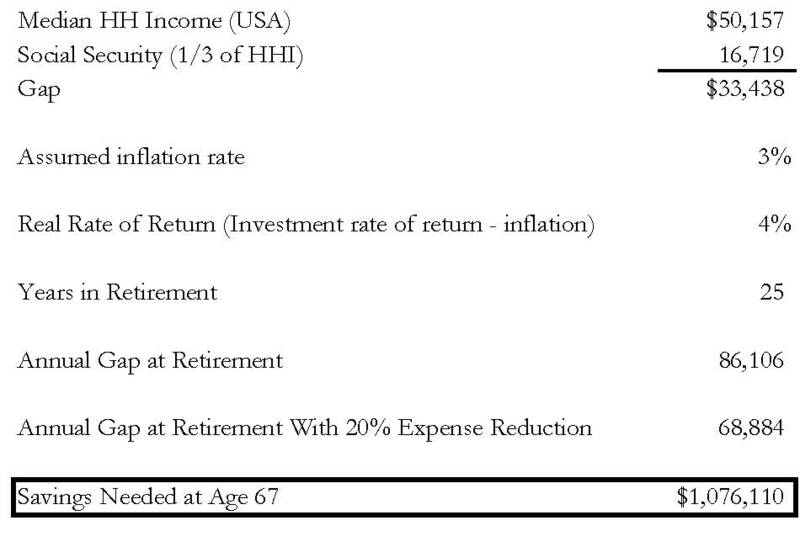 But how do we overcome the retirement problem? First, I agree we have a problem. 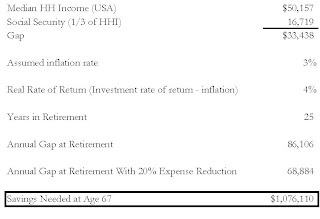 If a 35 year old earns the average household income in the country, then they will need over $1 million in savings to maintain their standard of living for a 25 year retirement (see table). This equates to saving $17,000 per year, every year, until this family reaches 67. I think this family needs a trusted advisor to tell them this, and map their path to get to their hoped-for retirement. So how can this family save $17,000 of a $50,000 annual income? Well, part of it can be accomplished through the now-typical employer 401(k) plan, where the employer matches some form of employee savings. Also, Uncle Sam picks up part of the tab. The employee can save all of the needed savings tax deferred. If the family is in the 15% marginal rate, then Uncle Sam picks up the equivalent of 15% of those contributions. 1. The Retirement System Should Be Universal and Automatic. I agree it should be automatic. Universal sounds like Big Brother is telling you what to do. This is a continuing theme with the US Government... Americans are too stupid to care for themselves and need us (i.e. the Government). 2. The Retirement System Should Give People Certainty. I think peace of mind would be better than certainty. Many great US companies went down the tubes as a result of defined benefit pension plans. 3. Retirement is Shared Responsibility. The US Government already shares with Social Security. The only other sharing (i.e. controlling) they should do is enforce laws against the charlatans that plague the investment community. 4. Retirement Assets Should Be Pooled and Professionally Managed. Well, we call that mutual funds, don't we? But I think Harkins' group is suggesting more centralized control in defining "professionally managed". I don't disagree with the retirement challenge. I also think saving should be automatic. But I disagree with greater control of a national pension system in Washington. Here is where I think community banks, banded together through associations such as the ABA or ICBA, can play a critical role in solving our problem. There are countless examples of organizations coming together for a cause. The Rotary Foundation strives to eradicate polio. Feed the Children, well, is self explanatory. Why can't community financial institutions band together to help customers prepare for retirement? I'm not talking about our frequently half-hearted attempt at retail investment sales. I'm talking about a national program, established through our associations, that vets money managers like associations now vet "approved" vendors, and establishes low cost investment option packages that customers can select based on their risk appetite. They can range in risk from mostly all stock funds, to mostly all bank CDs. The key will be to automatically move the money monthly from customers checking account into a tax advantaged IRA-type account. I'm not suggesting receiving no compensation for it. But keep fees low, such as 25-50 bps. Negotiations with money managers can partially offset these fees, since nationally community banks will be placing large sums of money into these funds. The money will be portable, and owned by customers, and not the federal government. I think we can establish a national program that meets the Senate committee's four principles, without it morphing into another federal bureaucracy to be tinkered with by future elected officials, as is the case with the Social Security system. Imagine, a middle class family, through their local financial institution, putting away $250/month into such a program, in addition to their 401(k) plans at work. We can play a positive role in helping our customers enjoy their retirement years, and achieve piece of mind. Should we band together and embrace the retirement cause?